We are always looking for ways to improve the app. It's now possible to view all eptile images on the app. Tap the image on the "My reptiles" list to view the images. If you have multiple images, tapping the image will show the next image"
With this update you can now display a larger version of your images on the device. This is useful in particular when showing images on tablet devices. Note that this requires that the original upload is of good quality. Possible to change a feeding to "refused feed"
Via the activities list you can now directly register a "refused feed". This means that you can perform a feeding and directly change it to a "refused feed". Activities are now separated into "today", "last week", and "last month"
The activities list now displays todays activity by default. You can then switch to viewing last weeks and last months activity. Search now includes "make/female", and "for sale"
The search function now makes it possible to search by gender and find only those who are for sale. The interface has been changed since the last version to use a different set of colors. Able to add "Global" Comment on Sales Card. Able to Set "Due Time" under each Reptile. (Due time is the time in days from "Laid Date" to expected "Hatch Date"
Under "Show" for a reptile you now see what Clutch the reptile are related to. Under Clutch - it is now possible to serach of rmother and father. BUG FIX - "Shed" on Sales Card - Now shows the last Shed date. BUG FIX - Problems with adding pictures in now Fiexed. BUG FIX - Slow respons on server. 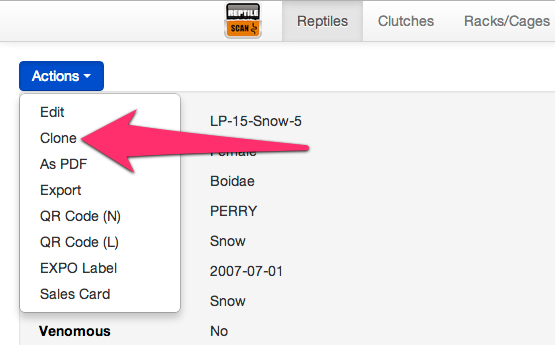 (1) You can now view all the latest activity across your reptiles on one list. Go to the "My Reptiles" list and press the "Activities" button at the bottom of the screen. Now you will see all the latest activities across all reptiles. From here you can also remove registrations by tapping on the entry you want to remove. (2) You can now delete a reptile from the app. Go to the "My reptiles list" and then tap on the reptile you want to remove. Now you will have a "Delete" button at the bottom of the screen. (3) It's possible to remove registration from a reptile. 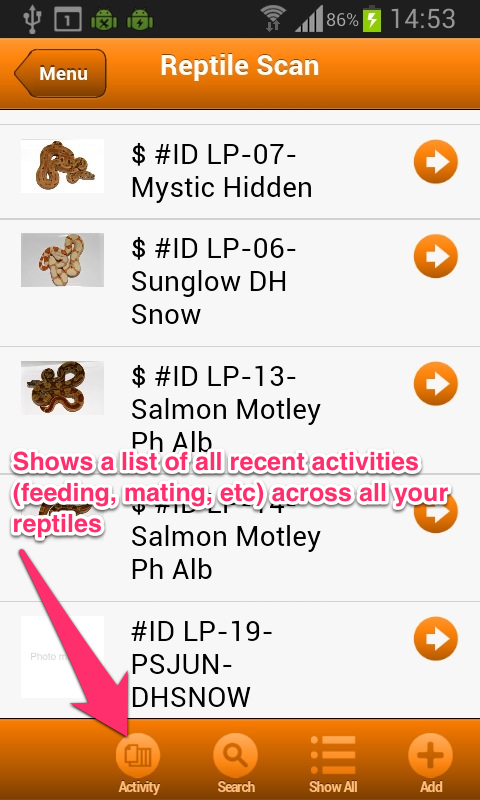 Go to "My reptiles list" and tap on the reptile you want to see. On the activities list you can now tap an an entry and then select to remove it. 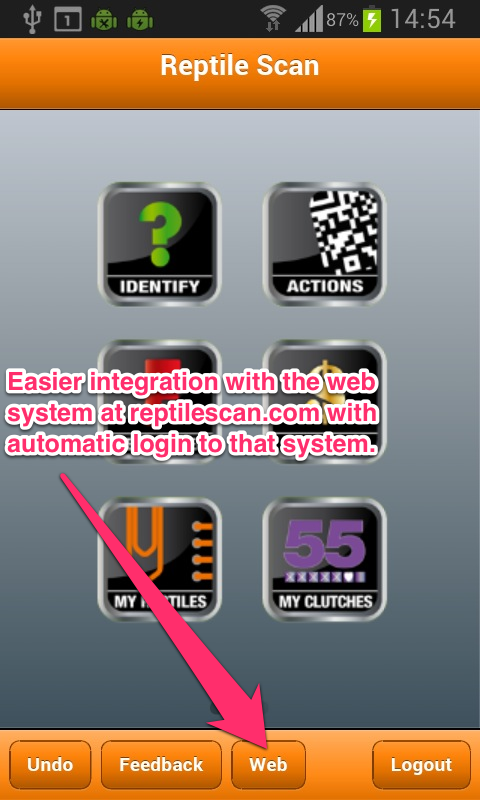 (4) The integration to the web system at reptilescan.com is improved in this version. You no longer have to log into the web system, just tap the "Web" button on the front page of the app and you will automatically by logged into the web applikation. From there you can manage your reptiles in the same way as you can on reptilescan.com. If you click "Show" for a reptile then the action menu has a new option "Clone". This will clone all the basic information for that reptile. This is useful for quickly creating a new reptile based on an existing reptiles data. From the main reptile list you can now access the "Needs feed" list. This has the same function as the "Needs Feed" button in the App. Devices that support the torch (flashlight) function will now use the torch during QR code scanning. My Racks / Cages button. Rack Feeding / Action on the APP. Create of Racks / Animals / Cages on the APP. Total new design of www.ReptileScan.com - so it will be more compatible to mobile devices. Graf / Diagrams over weight registrations. Set weight to feeding preys. Possible to manage set up of my reptiles list. Possible to create group of animals - same species. My Reptiles - Now shows pictures of your reptiles. Posssibility to create actions ect. - directly on the APP without scanning. Registration of Length is now possible. New Design of the APP. The APP now remember the last action for the specific reptile. Notes - now shows under My Reptiles. 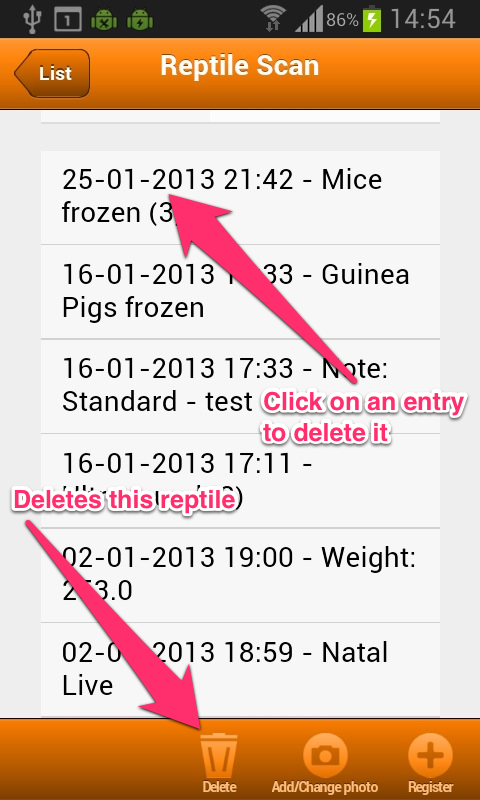 As you maybe already know we are working on a large update for our Reptile Scan APP. - How is Hungry button - Click this and you can see witch animal that are most "hungry"
- Ultrasound option - date of scanning and number and size of follicles. - More options under Actions - with the possibility to chose the menu as you like it. You can close the ones you don't need. - IOS 6 and iPhone 5 compatible. - Push message - from your own created alarms. - One Scan - for more actions. - Possibility to add pictures on Mom and Dad - if you don't own the snakes. - More options to Clutches. - The list of Reptiles, Clutches, Racks/ Gages - can be sorted as you like. - Clutch ID# - can be changed. - Upload of your own logo - for all PDF files. - Possibility to mark a animal as Sold. - Possibility to mark a animal as Reserved. - Possibility to mark a animal to be Dead - without deleting it. - Possibility to set feeding interval for each snake. - Create your own alarms - so you get a Push message when you need to remember. - Possibility to set data format as you like - dd-mm-yyyy or yyyy-mm-dd. If you have something you like to get in the program - give us your feedback then we will implement it into Reptile Scan. We want the Reptile Scan - to be the best APP for reptiles on the market - your feedback helps us to do that.